From the beginning of time, people have tried to understand aging and processes associated with the biology of aging. Many scientists believe that aging results from the repetitive damage caused to our body cells. The everyday metabolic activities that usually sustain our life but also create “metabolic stress”, which over time, results in damage to our bodies. Some of these metabolic activities result in the production of radicals and which may cause harmful damage to our body cells. Atoms are stable when the orbitals in their shells are fully filled with electrons and each of them can only accommodate a maximum of two electrons or a pair of electrons. Atoms or molecules that have orbitals containing a single unpaired electron tend to be highly unstable, they are called Free Radicals. Free radicals may be formed when a covalent bond is broken such that each portion keeps its own share or they may be formed when an atom or molecule accepts a single electron transferred during an oxidation-reduction reaction. Free radicals may be harmful or may be beneficial but most are considered harmful. They affect us in various ways listed below. Free radicals are extremely reactive and capable of chemically altering many types of molecules, including proteins, nucleic acids, and lipids. They attack important macromolecules leading to cell damage and homeostatic disruption. Free radicals are said to be involved in many disorders linked with advancing age, including cancer, atherosclerosis, cataracts, and neurodegeneration. Some free radicals are also beneficial. For example, in our immune system, oxygen free radicals are used to destroy bacteria and other harmful organisms. Who proposed their role in Aging Process? In 1956, Denham Harman of University of Nebraska came up with his “free radical theory of aging”, he proposed that aging results from tissue damage caused by free radicals but was failed to generate significant interest. Then, in 1969, Joe McCord and Irwin Fridovich of Duke University discovered an enzyme, Superoxide Dismutase (SOD) whose sole function was the destruction of the superoxide radical (O2–). This discovery supported and complemented the theory that if the body has a mechanism exclusively for the destruction of free radicals then they might be harmful to our body systems. Studies of mutant bacteria and yeast that lack Superoxide Dismutase (SOD) enzyme revealed that these cells were not able to grow in the presence of oxygen due to the accumulation of oxygen free radicals in them. Similarly, mice that were lacking the mitochondrial version of the enzyme (SOD) were not able to survive more than a week or so after birth. While mice that were genetically engineered in order to produce huge levels of free radical destroying enzyme lived 20% longer than those lacking this enzyme. NIA – supported researchers found that inserting extra copies of the SOD gene into fruit flies extended the average lifespan of fruit flies by as much as 30%. How are they formed inside our Body? Free radicals are derived from normal essential metabolic processes in the human body. Some examples of such processes that serve as a source of free radicals are those involved in the respiratory chain, in phagocytosis, in prostaglandins synthesis, and in the cytochrome P-450 system. However, a variety of environmental factors, including tobacco, smoke, sun exposure, air pollutants, and industrial chemicals can also produce them. How is our body protected against free radicals? Antioxidants are the substances that are able to destroy free radicals present inside our bodies. Common antioxidants found in the body include nutrients, such as, Vitamin E and C and beta-carotene (red colored pigment found in carrot), and also some enzymes that are produced naturally in cells, such as superoxide dismutase (SOD), catalase and glutathione peroxidase. These antioxidants delay or inhibit cellular damage mainly through their free radical scavenging property of donating an electron to a free radical and thus neutralizing them by making them stable. They can safely interact with free radicals and terminate the chain reaction before vital molecules are damaged. 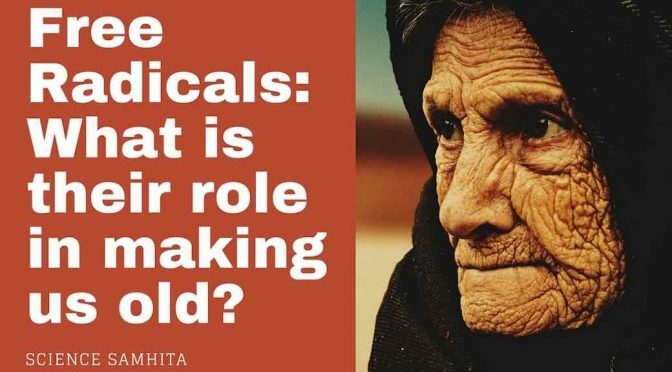 Why the role of free radicals in aging remains controversial till date? In a new study published in Cell, researchers at McGill University in Canada have discovered that free radicals promote longevity instead of aging. He and his colleagues used a nematode worm Caenorhabditis elegans, an organism used widely in lab studies, but Hekimi believes that the finding will translate into higher organisms like mice and humans because these systems are so fundamental. Bachai, Sabrina. ‘Scientists Say There Is A Link Between Cell Suicide And Longevity’. Medical Daily. N. p., 2014. Web. 9 Nov. 2015. Yang, Wen, and Siegfried Hekimi. ‘A Mitochondrial Superoxide Signal Triggers Increased Longevity In Caenorhabditis Elegans’. PLoS Biology 8.12 (2010): e1000556. Web. 9 Nov. 2015. Yee C, Yang W, Hekimi S. The Intrinsic Apoptosis Pathway Mediates the Pro-Longevity Response to Mitochondrial ROS in C. elegans. Cell. 2014. Lobo, V. et al. “Free Radicals, Antioxidants, and Functional Foods: Impact on Human Health.” Pharmacognosy Reviews 4.8 (2010): 118–126. PMC. Web. 9 Nov. 2015. Previous PostWhat are SNPs? Why are Scientists interested in them?Next PostWhat are Antitranspirants? How do they Reduce Water Loss in Plants? very informative content on free radicals..it is interesting to note that these free radicals also play a part in promoting longevity..!! !